Clients trust our brand and the recommendations of other physicians. Our team is committed to providing the highest quality products, service, and support. Patient Chart Manager is ONC Certified. We know the ropes. We have 3 decades of proven results. 30 years in business. In 1983, Prime Clinical built a strong foundation and has built the company to now serve over 10,000 physicians nationwide. Big enough to get the job done, but small enough to listen. 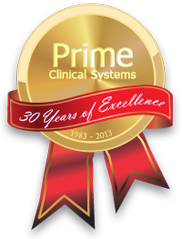 Since planting our roots 30 years ago, Prime Clinical Systems has grown to be a company that physician practices know and trust. Our leading EHR and Practice Management solutions help practices accomplish quality and accuracy in patient care, increase efficiency and productivity, and achieve EHR-related goals like Meaningful Use. We also take great pride in the excellence that we stand for as a company – and we show our commitment to our clients by providing top-quality service and support. We are able to accomplish this thanks to the expert knowledge and personal attention of our employees. Don’t take our word for it. Read our case studies and client testimonials to see how Prime Clinical has helped practices in all specialties successfully implement an EHR. Prime Clinical Systems were willing to customize as per our requirements and worked closely with us. They helped us to effectively cut down on our cost of employees and increase revenue production. Prime Clinical Systems has helped in making our job less tedious, and we have enjoyed the prompt customer service and the response time they offer to any issues that may arise. We quickly became a paperless office, which is quite a feat for our practice. We had accumulated more than 300,000 charts in the seven years of our existence. We had storage space all over the city, in an effort just to maintain these charts. The cost of this storage space started to approach the same amount that we pay for rent on our medical offices. It started to seriously impede our chase flow. From the very first time when the system was implemented up until now, Prime Clinical has been totally committed to providing the best customer service, and they strive to make all our issues of concern solvable. The features that have been incorporated into our daily medical practice have been remarkable and during these years of using them on a daily basis have enabled us to reach our goals and objectives. Our previous system was not user friendly and was not supporting pediatric care. We needed a system that would meet the very specific requirements associated with treating children and a vendor that would be easy to work with. The doctors in the practice were impressed with the fact that Prime was willing to work with us to customize the system so that it would truly meet the needs of pediatric medicine.